The “Healthy Kids Are Contagious” school program has been up and running for over ten years. We have found that the “5 keys to Wellness” health improvement system is simple enough for a 5 year old to begin to learn and use each day and when practiced often, these lessons last a lifetime. We found it worked best when the schools allowed us to visit at least annually to remind students of the tools and build on them as they age each year. As kids use this health system they become contagious and soon parents, teachers and friends are all inspired to live well. Each module is aimed at a grade level and it is easy enough for anyone to teach. The “see one, do one, teach one” methodology has shown that those who choose to teach these keys become wellness role models. We hope you are inspired to start teaching the 5 keys today! Module 1 - Kindergarten/First Grade: This assembly style lesson inspires children to understand their value and to use positive words. 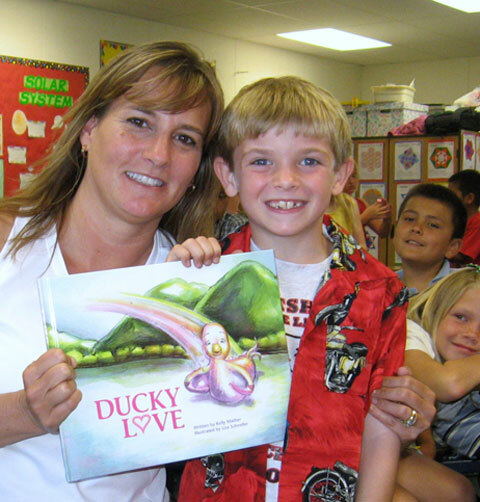 As you go through the story "Ducky Love", you will ask each child to say something nice about themselves and say something nice to a friend. You will encourage children to remember the story using animal poses from the characters while teaching ways to keep the body open and flexible. Module 2 - Second/Third Grade: This assembly style lesson inspires children to understand that breathing can improve their health. 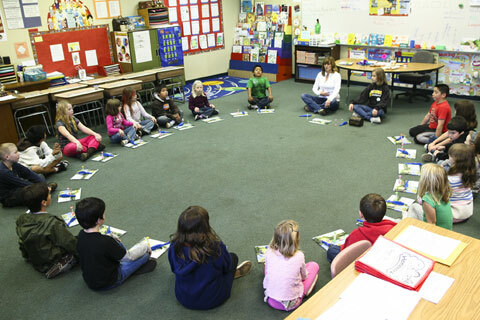 Children learn to become better breathers to reduce stress and worry. You will encourage time in nature to promote health. As you go through the story "Fish Breath" you will teach the children how to listen to their body through a body scan. You will also teach several types of breathing to increase oxygen, energy and clear their heads. Module 3 - Fourth/Fifth Grade: This assembly style lesson inspires children to learn the 5 keys to wellness with a special focus on positive choices. You will practice flexibility, cardiovascular and strength building exercises. As you go through the story "Froggy Choice: you will teach children about the importance of choice. We discuss their choices such as friends, habits, how they spend their time and the food and drink that they consume. Module 4 - Sixth Grade: At this age, children are forming their health habits for life. This classroom based lesson uses a workbook called "The Health Playbook" to inspire children to understand what creates their health. There are six lessons to be taught by you. The first lesson will help the kids determine whether they are making good health plays and if they are winning or losing the health game. They will complete a Wellness Wheel questionnaire and create a Wellness Wheel. They will learn to do a body scan and recognize that the body is sending them messages about their health. They will learn about the importance of stretching and moving moving 30 minutes each day. The second lesson will be about the 1st Key to Wellness - Self Love. They will learn that thoughts and actions create their health. They will learn that positive thoughts create better health and leads to feelings of self love. Self Love takes practice and they will learn new health plays that will help them win the health game. The third lesson will be about the 2nd Key to Wellness - Breathing. At this point they have learned what creates their health and the how to think positive and their mind has become a strong member ot their health team. When they deep breath their mind and body start to work as a team. Their breathing is directly connected to their feelings and as they deep breath, unhealthy feeling are replaced by healthier feelings. The fourth lesson will be about the 3rd Key to Wellness - Positive Choices. At this point their minds and bodies can work as a team to get them to a natural healthy state. In this lesson they will learn that the choices they make have a direct impact on their health. They will do health plays that will teach them how to make positive choices related to eating and drinking and other choices that are also important to create better health. The fifth lesson will be about the 4th Key to Wellness - Balance. Now that their mind and body are working as a team and they are making choices that support their health, they also need to learn to not over-do. The lesson will teach them how to do the right amount of everything each day related to play study, rest, and work. They will learn health plays to remind them to stay balanced and to spend time doing things they enjoy. The sixth lesson will be about the 5th Key to Wellness - Trust. At this point they have all they need to have a strong wellness wheel that easily rolls. There is just one last key that will help them win the health game and that is attitude and beliefs. They will learn daily practices and do healthy plays that will help them to believe in themselves. Module 5 - Seventh/Eighth Grade: This class based lesson inspires students to use a health risk assessment based on the 4 levels of healing to understand their current health status and what creates their health. The lesson will promote physical education in the classroom using physical, mental and emotional health assessments with a focus on the 4th Key to Wellness - Balance. This lesson encourages students to become aware of their current state of health and how to not over-do to maintain a healthy and balanced life. Module 6 - Ninth/Tenth Grade: This classroom style lesson teaches students how to use the health improvement system on a daily basis. Students assess their daily living habits using a checklist to log their thoughts, language, breathing, movement, food intake, and how they spend their time. The students will also be introduced to the glue that holds their wellness wheel together: the 5th Key to Wellness - Trust. This lesson inspires students to live well for life. Module 7 - Eleventh/Twelfth: This classroom style lesson teaches the students how to become health role models and teachers of the 5 Keys to Wellness. The goal of this program is to help students understand the health continuum and take accountability for it. Healthy role models are constantly working on self growth and improvement. As they experience life, they know how to maintain a positive outlook and calm demeaner as well as a healthy body for life.